For 24 years I always went to the UK for the summer to see my Mum, Dad and sister, taking the children, too, as they appeared on the scene. As Dad passed away in 1992 and Mum two years ago in 2011, my sister and I have spent the last few years meeting up in different places, somewhere between London and Tokyo. 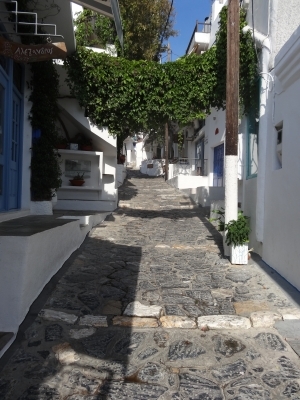 This summer we took a trip to Skyros island in Greece for a one-week writing holiday. Neither of us were sure what kind of holiday it would be but as we are both fond of writing we chose Skyros Holidays which has an excellent reputation for alternative, holistic holidays. The island is the least developed of any of the Greek islands and is simply beautiful. Cobalt blue sea, olive groves, white-washed houses perched on hills, cobbled streets and tiny shops selling pottery and embroidery, hand-made on the island. The writing course was run by Leigh Russell, a British best-selling crime novelist, and it was inspirational and fun. There were just nine of us on the writing course and others attended art or "life choices" courses. The Skyros Centre where we had our meals and courses provides a community atmosphere where everyone shares in some simple chores like washing up and sweeping leaves as well as daily meetings about plans for the day, walks and morning yoga sessions. We all got to know each other fairly quickly. One evening they held an auction to raise money for the local community on Skyros island. The Skyrian local government no longer has sufficient funds to run the schools and hospital so the Skyros Centre is helping out. All of the guests were encouraged to auction something they had with them or a service they could provide. It was really fun. One woman auctioned a tap-dancing lesson. Leigh's husband auctioned an hour's tax consultancy (he's an accountant) and some people offered their places back home for a holiday break. The art tutor suggested I auction the picture book I illustrated and co-authored with Mari Nakamura, Lily and the Moon. I only had one copy with me as I had planned to give it to my sister but she agreed to donate it and I'll send her another. Anyway the bidding was close and Lily ended up going for around 5000 yen which was donated to the local community! But the story does not end there. When I autographed the copy for Deirdre, the woman who bid the highest, she told me that she is planning to take the book to Zimbabwe to an orphanage where she does voluntary work as they really need books and teaching materials. 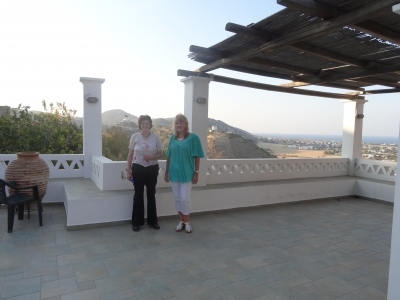 So Lily travelled from Tokyo, to Athens, to Skyros, then to London (Deirdre's home) and from there she will go to Zimbabwe! What an amazing journey she is on. Lily's story is about the journey that Lily takes with her friends. I went on a journey. And the book went on a journey. A journey within a journey within a journey. Lily took a little bit of happiness with her across the world. It is fascinating story isn't it! Soon will be coming the day,every children on this planet know Lily and the moon. Oh I say I haven't known that story yet. It was a fun kind of connection particularly as the story of Lily and the Moon is also about the long journey Lily takes in search of a ladybug on the moon and on the way she makes many new friends.